Green pants and an orange shirt today? Probably not. So if you take care to not dress tacky, be careful what you do to your blog. What am I talking about? Well, most Reading Workshop students are working hard to create the best blog possible. Their writing is improving daily. Whatever we do, we don't want to waste that effort. However, just because you learned how to change the color of words and background, it doesn't mean you should. Do you want to be a STAR? 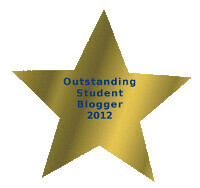 Do you want recognition as an Outstanding Student Blogger? 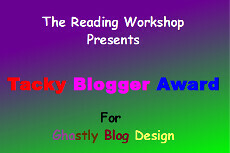 Would you like to have an award like this on your blog? To earn this award, students must post often with interesting content that engages the reader. Posts should be on a variety of topics that draw readers to your blog and keep them coming back. There should be links to relative web sites and pictures that help illustrate the writer's point. And as always, PUGS (Punctuation, Usage, Grammar, and Spelling) must be correct. If you want to see some examples, these Reading Workshop students have already earned Outstanding Student Blogger Awards. Can You Give Students a Helping Hand? 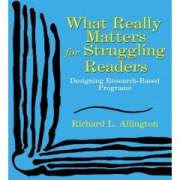 Parents, grandparents, aunts, and uncles, could you spare a few minutes a week to help the students in Reading Workshop? All you need is Internet access and some type of devise to post comments (laptop, PC, IPad, smart phone, etc.). Students have been working hard on their blogs. Their writing is getting better, both with content and mechanics. Although they are beginning to build readership, getting frequent comments motivates them like nothing else. And here is where you could help. On the right sidebar, students' blogs are listed with links under 2012 Student Blogs. They are listed by classes 601-604. If you would comment on a few blogs, you could help make a difference to a young writer. Some students get quite a few comments, but some hardly ever get any. You could let these kids know they have an audience that cares about their blog by posting a short, positive comment on their blog. This idea originated from Laura Crosby who has been taking some time to comment on The Reading Workshop student blogs for the last few weeks. The results have been very positive and students really have felt great reading her remarks about their posts. Please take a few minutes and make a student's day. It doesn't matter if it's someone you know or not. Believe me, all students appreciate it when someone has something good to say about their writing. If you have questions about how to get started, just send me an email at Mr. McGuire. We are beginning to focus on poetry in Reading Workshop. The best poetry sparks some sort of emotion within the reader. A good poem should make us laugh or make us cry. It might surprise us or make us think. It might open our hearts and connect us with the writer. As we work towards the craft of becoming writers, and with the hope of opening awareness of others, students have a special assignment. During the next five days, give to someone else. The task is ten random acts of kindness. This can be to a peer, a friend, a relative, or a total stranger. The point though is to focus on the interaction of the person involved. On Friday, Reading Workshop students will pick one event, emotion, thought, or idea from the week and share it in a poem. I am sure with this year's students, there will be some amazing poetry. How would you feel if you had seven students that wrote on the weekend? This wasn't an assignment, and they didn't get extra credit. This was just students taking pride in their work and writing on their blog. I can tell you this teacher is proud of the effort! If you want to check out some good examples of students' blogs, here is a good place to start! Want a fun activity in Reading Workshop where you do a lot of work and don't get any credit and you have to do it on your own time? If so, maybe you can do a book talk. The only reward is fame. This is a book talk on Drive-by written by Lynne Ewing done by former Reading Workshop student, Kennedy. After all of the talk about blog comments, I thought I would share a couple of good examples from Reading Workshop students. That book sounds like a book I read. But this one is a little different. I love books that makes me close to falling out of my chair because it has me on the edge on my seat. Don't you? I mean who doesn't? It sounds like to me that the book is one from a series. Is there a series? It sounds pretty exciting and adventurous. How would you describe it? I think you did a really good job on your post. When you get the time please comment back and answer my questions. I might want to read the series because it sounds like a good book. I think your post is really cool. But you said manga [I think that is a cool book type name] are Japanese based comic books. I just want to know if they are comic books or regular books. How long are the books becuase comic books you can read about 6 in an hour or are they really long? I think your blog is really good. You do a really good job on your blog. WOW!!!!!!!!!! This post is really good! I love to sing too! But anyways your post shows how you love to sing and how you interact with your personality. Most of all no matter what you’ll never give up on it! I have heard you sing and you are really good! Here’s a note NEVER GIVE UP ON WHAT YOU LOVE TO DO! On The Reading Workshop blog I have seen some excellent comments this year. I am reading The Hunger Games written by Suzanne Collins. I picked this book because all of my friends have read and said they loved the book. So I decided to give it a try. Right when I started reading it I was attached. I couldn't believe how good it was. What really dragged me into it was the beginning because I liked when Effie Trinket was picking the names out of the bucket because Katniss's little sister Prim gets chosen to go to the Hunger Games. But Katniss didn't want her sister to get killed. So Katniss steps up and goes to the Hunger Games. That's why I this book is one of the best books I have ever read. So don't fake read, just find a book that you really like!! It is very important to work hard because if you work hard and take your time, you know that you tried your best, and you made a effort to get a good grade. Sometimes even when you try your hardest you will not get an A but that's okay because you gave it all you got. I admit I don't always take my time to do something because I want to hurry up and rush through it. I've worked really hard on projects and work before too. I think it is so important to check over your work because it does make a difference to go over all the questions. As the writer for The Reading Workshop blog, I appreciate it when someone takes the time to comment. Every student wants comments for their blog too. What makes it even better is when the comment is well thought out, well written, and meaningful. Thanks to all of the Reading Workshop students for making an effort to write excellent comments. 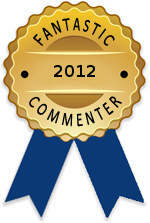 Keep up the good work and maybe you can get a Fantastic Commenter badge on your blog! Have You Checked Your Homophones Lately? Is your writing more like 1 or 2? 1. Due ewe no you're homophones? Win u our threw righting, due yew no if there write?. 2. Do you know your homophones? When you are through writing, do you know if they're right? Reading Workshop students, please give your readers a break. Check your homophones and get it right! For more information see Your Homophone is Out of Order. Thanks to Gineriella for allowing this edited version of her video to be used in the classroom. This is being reposted from Megan's Thoughts. Hello again, its Megan! 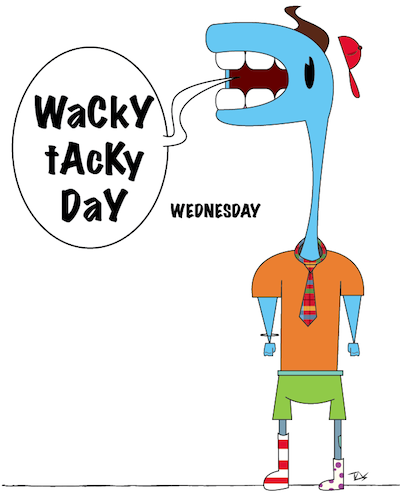 I just wanted to remind everyone that Friday, October 13th Saltcreek Intermediate School is going to have a hat day! 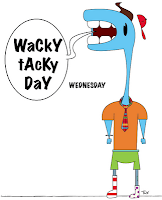 All you have to do is bring in 25 cents or more to wear your hat all day long! 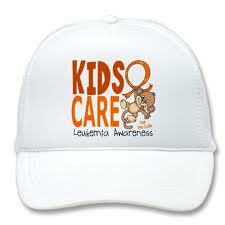 All the money that student council raises is going toward a special girl in the sixth grade who has leukemia. We will donate the money toward whatever her family needs, to help her get better. Just remember to bring in a hat and a quarter to help her. Your classes student council representative will collect the money in each class. Thank you for reading! This is a great cause so please bring in money on Friday to help the Student Council help one of our students and her family. Students in Reading Workshop are building their blogs, post by post. 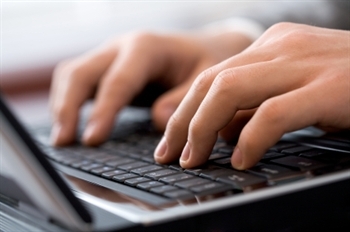 In addition, many are taking the time to comment on their peers' blogs. Here is some information about commenting to help with this. Everyone that blogs wants comments. We want every single person that visits our blog to comment. In fact, almost any comment is better than none. 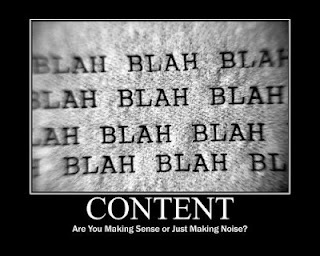 So if you visit a blog, the most important rule for blog comments is to comment. Take a minute and let us know you were here and what you think. You need to know though, that commenting is a competition. You are vying for the reader's attention. You are trying to make others agree with you. You want the reader to listen to you over other commenters, and you want to sound better than others. If you care enough to write, then you care enough to want to sound intelligent. If you agree, say so. If you disagree, or have a different opinion, say so. But whatever you do, be assured, bloggers love comments. All comments are appreciated. However, nothing beats a comment from someone that is intelligent and makes a great point. 1. No personal abuse or name-calling, please. A positive tone wins over the reader, a negative tone drives readers away. 2. 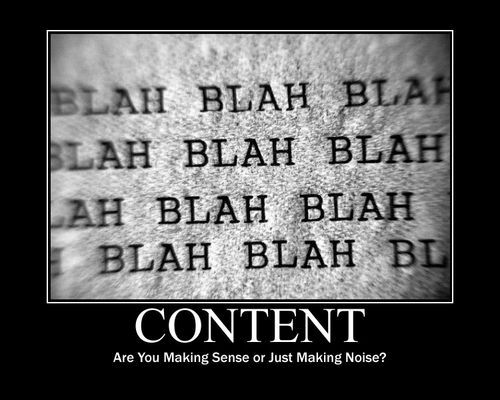 Your content is just as important as the bloggers. The first sentence MUST grab the reader. The first paragraph should give the reader an idea what the comment discusses. Keep on topic. Don't write a comment that has little or nothing to do with the subject of the article. 4. Mistakes, especially in grammar and spelling cause the reader to move on to the next comment. Readers assume if you can't write correctly you are not intelligent enough to be worth reading. 6. Don’t make comments like “Great post.” If you read it, say why it was great. Add some­thing to the con­ver­sa­tion. Add your own view, or thoughts to the topic. Throwing out a statement without telling why it matters, or how it impacts others, or what significance it has to the reader is worthless. If you are going to take the time to comment, take the time to do it right. Win the comment contest by writing a fabulous comment that makes readers think, or wonder, or smile, or cry, or agree, or disagree. Write a comment with meaning. Bloggers love comments. All comments are appreciated. However, nothing beats a comment from someone that is intelligent and makes a great point. Students weekly Read at Home assignment rewards extra effort. Students choose a book that they want to read from home, the library, or the book room. The only requirement is that they log the title, time read, and pages. As a teacher, I reward the students that make the most effort. Although grades are not entirely tied to how hard a student works, poor grades are reflective of a lack of work ethic. If a student wants a better grade, just read a little more. I even give extra credit for students that read more than 180 minutes. Although students have no direct assignments associated with Read at Home many of the activities and projects in class are based on the book they are reading. When students write about their book, it is easy to monitor comprehension and see if students are "getting it." The fact that students can pick their book to read helps because they can find a book that interests them. The bottom line--if students read more, their grade improves and they become better students. The students in Reading Workshop just completed an interdisciplinary project for social studies and language arts. They had to research about a place they had visited, list five facts, and then write a story about their trip. In addition, for their blog, they had to write an introduction, find relevant links, and post pictures that supported their writing. The project was graded using this rubric. OK, so you are sitting here in Reading Workshop during SSR (Sustained Silent Reading). I look up from my book and I see you fidgeting in your chair. You are squirming like your seat is on fire. You turn the page without even reading the whole page. You look around the room, but you can't find anyone to join you in your boredom. Uh oh, are you like the Queen of Fake Reading? If your book isn't drawing you in, you need to get a better book. There are 12,000 books with several thousand titles in the book room. Find one that you can be a part of and read. Don't read a book that isn't exciting. The guy beside you is staring at his book so intensely you think he might stare a hole in the page. What is going on with him? Why is he looking at his book like that? He won't even look your way. He is pulling the book closer and closer to his face. He has a death grip on it. Guess what? Some books are exciting and he found a great one. He found a book with action and adventure, that he understands. He has become a part of his book. He is living in it and with every twist and turn in the plot, he is drawn more and more into the story. What book are you reading? How does the author draw you into the book? What makes the book you are reading exciting?